Villa GANESHA is a magnificent beachfront property, located on the beautiful Flamands beach. It’s an imposing villa with a spacious interior and designed for lounging above stunning ocean views amid cooling trade winds. This the perfect retreat for friends traveling together, or families wishing to be on the beach. 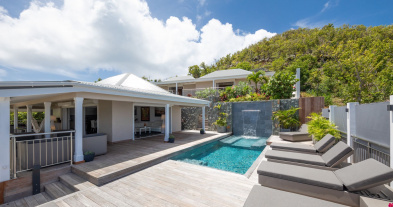 With its fabulous location directly on the beach at Flamands and its exquisite yet understated style, Villa GANESHA is a spacious three Bedroom property situated on the highly-praised location on the island. This charming and newly rebuilt villa offers a peaceful retreat from everyday stress, and you will love taking a nap while hearing the unforgettable song of the waves breaking on the beach. In the morning, walk down to the nearby bakery for fresh baked croissants and baguettes as the delicate scent of the finest French breads and pastries fill your senses. Or you can also stroll to a restaurant for lunch or dinner nearby. The retreat benefits from stunning ocean views amid cooling trade winds. Designed for ultimate comfort, the spacious interior of the villa is modern and very inviting and cozy. An open flow concept with minimal walls brings the indoors out and the wonderful views even closer to you, the villa gives you a feeling of ease and relaxation. 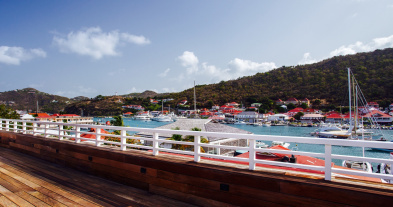 The living area and kitchen open directly onto the teak deck, where a shelter dining table seats ten for seaside lunches or dinners under the stars.The inside dining room with a massive and art wooden table is adjacent to the fully-equipped kitchen for gourmet. 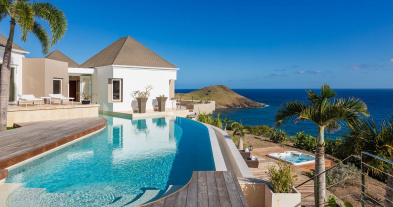 From the edge of the terrace, you will enjoy a wonderful pool, and you are just a few steps from the pure, white sand of one of the most desirable beaches on the island. All three bedrooms are large and have their own bathrooms and built-in wardrobes. They all have king-size beds and air conditioning and the extensive master bedroom which overlooks the rest of the villa, is equipped with an ensuite bathroom, a walk-in closet and an outdoor terrace with lounge chairs offering beautiful vistas of the ocean and the beach. The guests can enjoy relaxing moments in there as well as in the social and lounge areas of the villa. The pool terrace offers additional seating for twelve or more on large teak couches, and numerous chaises for sunning, and even a plaseant ping-pong table to have some fun under the coverered gazebo. Villa GANESHA is truly an exceptional property in every respect: in location, in amenities, and in design and decor. There are many things that make this villa one of the most beautiful destinations for both families and friends. 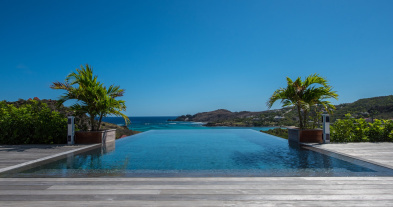 If you are looking for a contemporary and comfortable beachfront villa in St. Barths, Look no further than Villa GANESHA. Large dining table on the covered terrace by the kitchen and swimming pool, for 8 guests. Inside dining area in the air-conditioned ocean view great room, with a large rectangular wooden table. Queen size bed, air conditioning, flat screen television. The bedroom opens onto the living area. Ensuite bathroom with rain shower and regular shower head, hair dryer, bathrobes, towels and beach towels. Queen size bed, air conditioning, flat screen television. The bedroom has also two bunk beds. Ensuite bathroom with rain shower and regular shower head, hair dryer, bathrobes, towels and beach towels. Magnificent swimming pool, surrounded by a spacious terrace with lounge chairs, Long boards, outdoor shower, and a ping-pong table under the gazebo. Directly on the beach. Direct acces on the wonderful flamands beach, short walk to some restaurants and finest bakery, great private entrance and parking with code.